Bunions are quite common, especially older people. In some cases they can be quite painful. 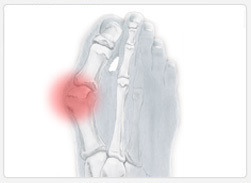 Bunions refer to the bony lump found at the large joint at the base of the big toe. Bunions are a progressive foot condition. In most cases they will become painful at some stage depending on the severity of the bunion and the amount of activity of the individual. When the foot over-pronates (rolls in) the entire foot twists to the center. This causes the big toe joint to twist as the big toe is fixed and planted securely on the ground and the foot in moving inwards, causing irritation of the bone and surrounding joint. When bone is irritated it will grow in order to protect its structure. The big toe is bent inwards and a bony lump forms on the outside. Over time the lump becomes larger and the bunion can become painful. Arthritis and stiffness can eventually develop. Callous and corns may develop on the bunion. Footlogics orthotic insoles can help prevent or reduce the formation of bunions by restoring our normal foot function and controlling excess pronation. Also, the built-in metatarsal support will help reduce pressure and friction, placed on the big toe joint. Furthermore, make sure that your shoes have a roomy toe box when you’re going to be on your feet a lot. If you have any pressure from your shoe on the bunion, or if your bunion is red and inflammed on the outside, then you should have a pocket stretched into your shoe to accommodate. In some cases surgery is required to remove the bony lump and to straighten the big toe.